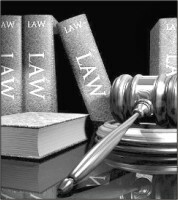 Legal education has immense impact on the rule of law. The present state of legal education in our country does not respond to the needs of a modern society. In our country there are two separate streams of legal education. One is private law colleges under the National University offering two-year postgraduate course and the other is four-year undergraduate course provided by the faculties of public and private universities. Recently private universities are also offering two-year postgraduate course. There exists a wide gap of quality of education between the colleges and the public/private universities. National University's role in making lawyers is limited to a certificate awarding body rather than a law institution. There are cases where a law graduate never attended any formal class. So the quality of graduates from National University varies enormously amongst themselves. The curriculum and teaching methodology of the law colleges are inadequate for producing law graduates that our nation needs to cope with our problems. The problems of law colleges which result in poor quality of education are: lack of funds, absence of government control and financial assistance, lack of academic facilities, infrastructural inadequacy, absence of full time teachers, poor management, irregularity in admission and examination of students, poor control and monitoring by the affiliating National University. There are four public and almost ten private universities in our country offering undergraduate/postgraduate law courses. The quality of education in public/private universities may be better, but they also need major reforms. Law is a practical social science. Both academic and vocational nature of legal education is important. Both these should exist in quality legal education. In our country, the methods of teaching are mostly lecture-based. There is no existence of practical methods of teaching, i.e. problem method, Socratic method, case study, moot-court and mock-trial. Only a few of public and private universities have started some of these methods but not all. There is no medical college in our country without a hospital and so in the legal profession a student should never become a lawyer without having real court-room experience. Since law graduates are expected to work in important sector of national life including judiciary and there is a special responsibility of the law graduates before the society, inter-disciplinary approach in legal education needs to be emphasised. Incorporating new branches of legal science relating to ICT, e-commerce and globalisation, fundamentals of economics, political science, sociology and history need to be incorporated in the curriculum. There exists very limited opportunity of studying law under government arrangement and patronisation. Presently the number of public universities is 26. But only four of these are offering degrees in law. The government allocates a huge amount of money for the subjects like accounting, biology, political science and so on. But a very important subject like law is very much neglected. So the allocation should be raised for legal education and the opportunity of studying law in the public universities should be increased. The establishment of the rule of law is a far cry without allocating money for legal education. The general concepts of law should be taught at secondary and higher secondary level. Clinical approach should be introduced in our legal education. Clinical legal education is basically practical legal training through moot-court, mock trial, participation of the students in public legal education i.e. mass legal awareness programmes, chamber practice with the lawyers, counseling etc. Clinical legal education is learning through doing, or by the experience of acting like a lawyer. It provides service to the people and hence it is more practical and noble. The Constitution of Bangladesh speaks about social justice which is the key pillar of the Constitution. We must not fail to ensure our citizens' right to access to law and justice. The need for reforms of legal education is a must to achieve this goal. Judges, lawyers, law teachers, law students, professional groups, members of civil society and various legal institutions throughout the country should come forward to act for this. Samir Bhowmik, a law graduate is a freelance writer on legal and rights issues.